Navigator Dave was keen to take the group to the beautiful Marden Park, an area in which he had run for many years, but this required some creativity due to the dearth (i.e. zero) of pubs in the parish of Woldingham. The solution was to meet at the familiar White Lion in Warlingham, from where the group drove a few miles to the Gangers Hill car park on the crest of the North Downs to start the walk. The group's next outing, on August 11, consisted of a dramatic ascent of Box Hill in Surrey. Trevor Watkins' young miniature dachshund Dasher was a new addition for the start of the walk from the Stepping Stones pub near Dorking. Trevor and Dasher valiantly tried to scamper along behind the main group for the first section across the River Mole water meadows but were hampered by short legs (Dasher's, not Trevor's). 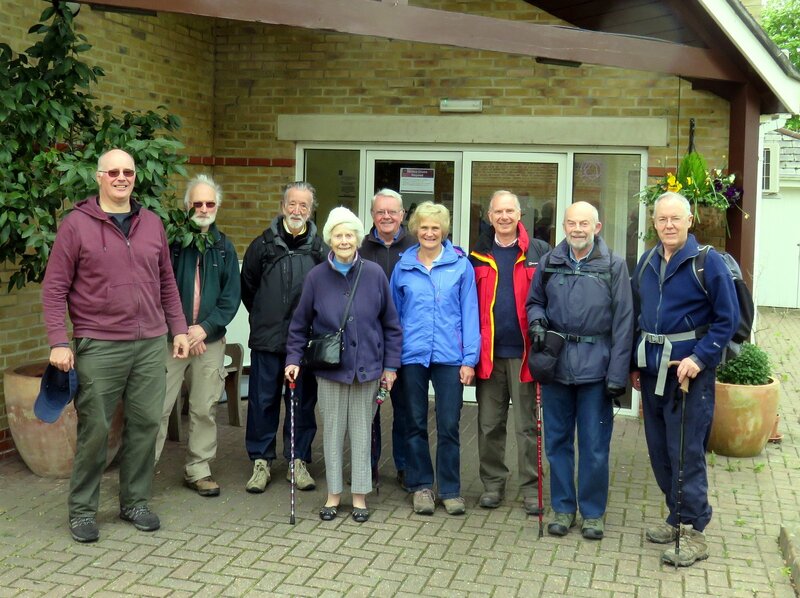 The walking group has been active since the record-breaking walk of April 28, undertaking three walks in the space of seven weeks. And it notched its fiftieth walk since the group was started in February 2012. Yet another record was smashed on on the choir walk on Friday 28 April. This time 90-year-old Jean Bannister, avid choir fan and mum of Dave the Navigator, joined the walkers at the Fleeting Brook pub for the first 400-metre stretch, thus breaking the group’s age record held jointly by (probably) Ted Mouat and Bob Mackay. The record-breaker was serenaded with a photo-call and a chorus of Soldiers’ Farewell at the door of Elizabeth Court Care Home at Caterham Village – built on the site of the commandant’s residence when Caterham Guards' Barracks was redeveloped some 20 years ago. 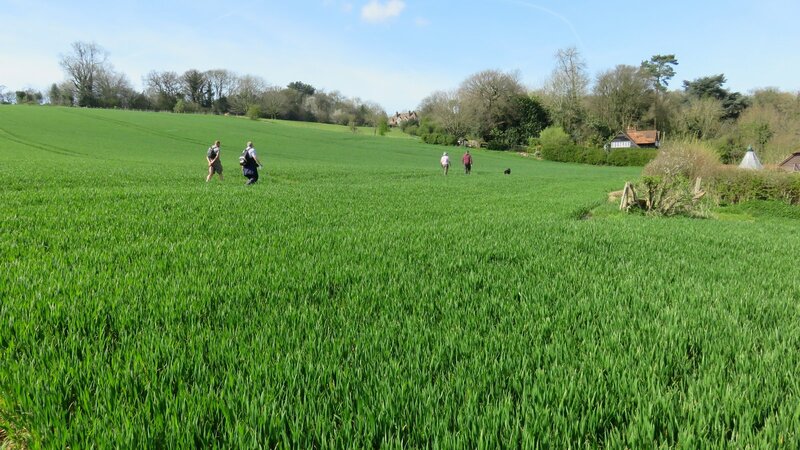 Fifteen walkers left the Feathers pub in Merstham at 1.30pm on 3 April in glorious sunshine. We stopped at St Katherine's Church, where we were invited to sing by a church official who had come to our concerts at the village hall, and My Lord soon resounded in the generous acoustic. Ten walkers, plus Nick's dog Misty, gathered at the totally suburban Shirley Crown on 15 March, wondering how Dave the Navigator could deliver on his promise of rural walking. 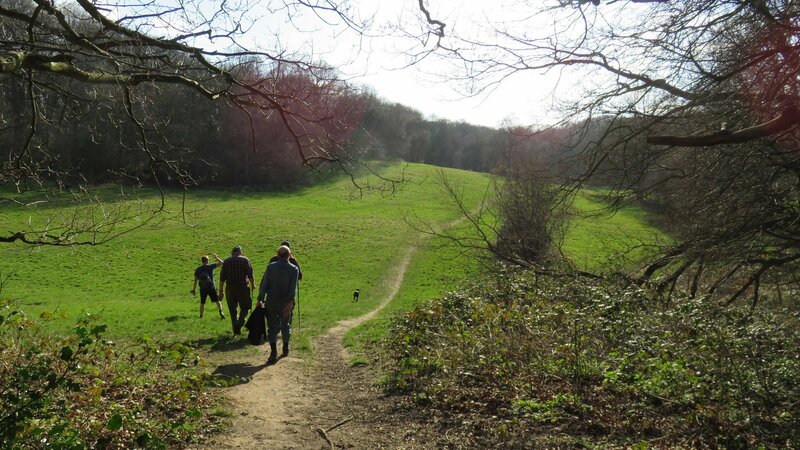 Not five minutes later, after admiring Shirley Windmill, the group had plunged into the woodland of Addington Hills. Dave explained how the Blackheath Bed pebble geology in this area was very rare, indicating the unique flora of stunted oaks, birch, gorse and heather. To their further surprise, he led them to the viewpoint where breath-taking panorama stretched northwards as far as the Wembley Arch and the Canary Wharf towers.